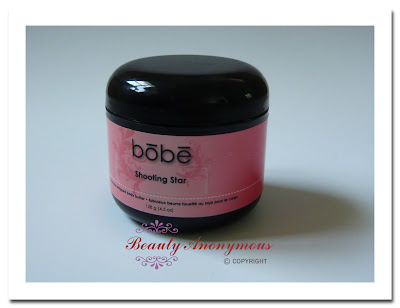 bōbē is a Canadian brand established in 2005 that offers bath and body products. All the products are made fresh when the customer places an order. And the ingredients are kept few and as simple as possible, which is good for sensitive skin. There are over a variety of 120 scents and flavors, blended with exotic ingredients and fragrant oils, for customer to choose from. Bath Mousse is a body cleanser with a light scent. It is available in more than 40 scents. The one I have tried is Green Tea & Cucumber. Green Tea & Cucumber has a delightful green note. It is pleasantly light and uplifting. The scent is suitable for hot summer days. Bath Mousse has an extraordinary feather-light texture. It has a fluffy mousse consistency. It turns into gentle foam in seconds when it is in contact with the skin. It feels like whipped cream, so silky and velvety on the skin. In fact, it feels so smooth and light that it also works as a good shaving cream. 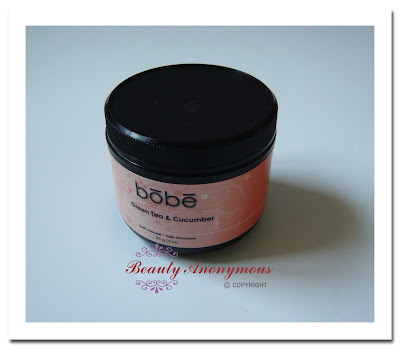 The mousse cleanser leaves my skin soft and moisturized. Soy Fabulous Whipped Body Butter provides moisture and soften the dry rough skin. It is made with a non-greasy formula. It leaves my skin soft and supple with good moisture without any sticky or filmy feeling. I can feel a touch of moist residue on the skin soon after the body cream is applied. But then, it does take some time to go away, presumably absorbed into skin. Soy Fabulous Whipped Body Butter has a whipped cream-like texture. It is easy to distribute the cream onto the skin. I have tried the one in the scent of Shooting Star. It is a sweet fruity aroma with a grassy note. I like the lightness and crispness of the green note. The sweet part is a little overpowering initially, but it starts to go away after a little while. I personally prefer clean green notes for bath and body products. For people who love sweet fruity aromas, Shooting Star would be the scent you will like. 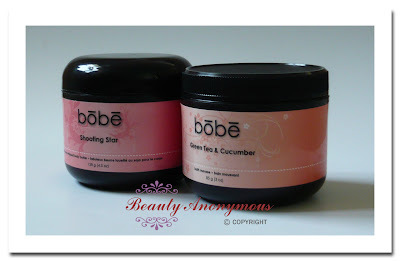 You can purchase bōbē bath and body products at its website. The company is committed to giving back and supporting charities. 5% of bōbē retail sales are given to a different charity in each month.